Invoicing system for anyone who needs to do invoice processing. 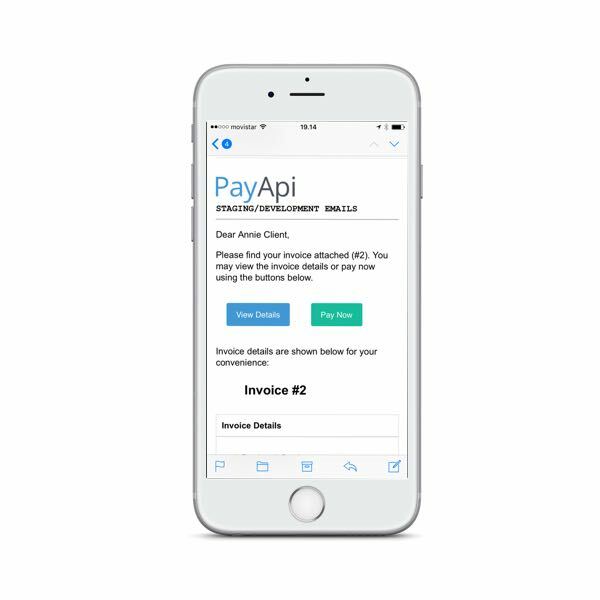 If you have clients and you need to send invoices, PayApi is for you. It´s easy to use and it helps you to follow the status of the invoices in real-time. You can send invoices and pay them from the office or with your mobile while you are sitting in the bus. PayApi saves your time! With PayApi you can offer a wide range of payment methods to your clients: from credit card to pay in parts. PayApi will remind your clients of possible unpaid invoices and add a fee if needed. It helps your daily work! Create professional and personalized invoices and follow the status of the payments. You can change the currency and tax percentages for you invoices. PayApi works globally! Save time by creating a client list that you can use for each time you send out an invoice. Keep it updated easily. PayApi works for you. The system follows up on outstanding payments, and sends the necessary notifications and adds interest if required. If you need to send the same invoice multiple times, it is very easy to set up with PayApi. It remembers to send the invoice when it on the scheduled date. Or, you can copy the existing invoice, edit and send it yourself. PayApi is a PCI DSS Level 1 Compliant system, and that ensures the secure flow of money transactions from your clients to you. Read more about our security features. Choose the settings for your invoices and decide which payments methods you will offer to your clients. Add the client to your client list. Create the invoice and send it to the client. Follow up on payments for your list of invoices. Interested? Contact us and we will make you an offer to start using PayApi Easy Invoicing.